What is Sjogren's syndrome and how to treat it? Sjogren's syndrome is a chronic and systemic autoimmune disease, characterized by creating antibodies that attack our own tissues. This disease causes inflammation of certain glands in the body, which is primarily related to the lacrimal and salivary glands. For this unique disease there is no cure and treatment is mainly based on symptomatic therapy. It is important for an early diagnosis in order to be able to prevent more complications. What are the causes, and how to recognize the signs and symptoms and how to treat the disease find out below. Causes for Sjogren's syndrome are not completely known even today. Medical experts classified it into risk groups of genetically predisposed persons, probably under the influence of some viruses, undermined the immune system to the extent that they create antibodies that attack lacrimal and salivary glands. Then, most likely, as a result of an immune response results in chronic inflammation and with time consequent loss of function in the mentioned glands. One of the best prevention is to strengthen the body and do not allow the loss of immunity, this is especially important for people where the family has been diagnosed with Sjogren's syndrome. The disease is nine times more common among women than men, especially in middle age from forty to sixty years of age. Dry mouth and throat, swollen and white tongue, a burning sensation in the eyes are usually the first symptoms of Sjogren syndrome. These signs of disease vary and are not typical signs that apply to all affected individuals. At the very beginning there is a possible slight increase in the salivary glands, which are soft and not painful to touch. In time as the disease progresses it is becoming harder and more painful, is sensitive to the slightest touch and there is noticeable redness of the skin around it. The characteristic of the disease and there is difficulty in swallowing due to dry mouth, and sometimes difficult speech. In more severe forms the gingiva can be very irritated, painful, red, inflamed gums, creating more plaque and tooth decay which can cause teeth to fall out. Regardless of the severity, initial symptoms are constant tiredness and fatigue, sleepiness during the day, fever, vascular skin changes and unfavourable arthritis. 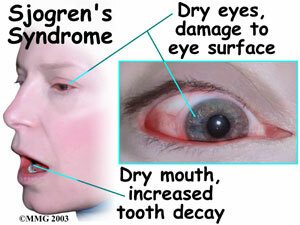 The disease is divided into primary and secondary Sjogren's syndrome. Primary affects exclusively lacrimal and salivary glands, while the secondary is associated with other autoimmune diseases (systemic lupus, scleroderma and rheumatoid arthritis), and is therefore the treatment is much more complicated and difficult because it involves many organs. Secondary Sjogren's syndrome in women can cause vaginal dryness, sometimes it affects skin and nose. Systematic character to the disease is given by complications of other organs such as the lungs, kidneys, endocrine glands and nerves, and they occur in almost 50 percent of patients. As the official cure for Sjogren's syndrome does not exist, local symptomatic therapy is applied. For the treatment of dry mouth it is recommended to use artificial saliva, while the artificial tears will reduce the burning sensation and irritation of eyes. As a prevention official medicine in particular draws attention to good oral hygiene. For dry eyes it is recommended to use goggles that will reduce drying of the eyes. Important note: if you have Sjogren avoid antihistamines and nasal decongestive because they can deteriorate even more your medical condition. In case of secondary systemic diseases, apply drugs and therapies for specific problems such as drugs for thyroid, aching joints. They can be prescribed only by a doctor. What is the function of the salivary glands? Salivary glands are located in our oral cavity and form an integral part of the system of the digestive tract. During the process of digestion they participate in a way that secretes saliva. Due to their location and size, we divide them into small and large. Small salivary glands have 700-1000, and their primary role is to continually moisturize the mucous membranes, while large salivary glands secrete saliva under the control of vegetative nervous system. The largest pair of salivary glands is located around the corner of the lower jaw, in front of our ears, two smaller pairs are deep in the mouth, while the small salivary glands are scattered throughout the oral cavity. When the saliva is not light enough, the mouth becomes very dry. Given that saliva protects the teeth from bacteria, its insufficient secretion may affect tooth decay. Except in malfunction of the salivary glands, the mouth may be dry due to the inability to breathe through the nose, insufficient intake of water during the day, taking certain drugs, stress, depression, anxiety, or influence of some diseases that affects these glands, such as Sjögren syndrome. In any case, changes in the amount and composition of the saliva must be tested in order to remove suspicion of a serious disease of the salivary glands or on the whole body system. It is necessary to have an adequate diet for Sjogren syndrome. You need to prevent further drying out of the mouth and it is also the most important part of treatment of this disease. First, you should give up alcohol then coffee and caffeinated beverages. It is also necessary to avoid eating extremely salty, sour, hot and spicy foods, as well as too acidic beverages that cause pain when the mouth is dry. Avoid industrial juices and instead you should drink natural juice of apples or peaches, as well as beneficial milkshakes (mild probiotic yogurt, kefir). Consuming sugary snack foods should be kept to a minimum and leave cigarettes because tobacco smoke dries the oral cavity. On the other hand, the water should be drunk throughout the day and in frequent sips at a time to make oral cavity remain moist and hydrated. Food based on seasonal fruits and vegetables and drink substantial quantities of fibre. Daily recreation is advised in the form of walking, jogging, cycling and light exercise, in order to maintain flexibility of joints and flexibility of muscles. Castor oil packs, as well as teas from burdock root and sage can calm inflammation, reduce swelling and relieve discomfort caused by Sjogren syndrome. If it is possible, try to get a fresh root of the plant Echinacea, because its chewing stimulates saliva production. Some juices and homemade herbal teas such as chamomile, sage are very useful because they eliminate these symptoms and stimulate better work of the salivary glands, and their prolonged use eliminates the main problem. Use castor oil packs to relieve pain in the sensitive, swollen salivary glands. Warm up castor oil so that it is pleasantly warm, not hot. Soak a clean wash mitt with this oil, place it on a painful salivary glands and leave it to stand in this place no longer than fifteen minutes. Procedure is repeated every day two or three times. One tablespoon of chopped finer roots of burdock and two tablespoons of finely chopped also sage is poured into 600 ml of boiling water only. Let it stand covered for at least two hours, strain it well and then gargle in the mouth. Take two tablespoons of finely chopped leaves and flowers of teucrium chamaedrys and finely chopped leaf of common wormwood or its bloom with buds. Put everything in a 6 dl only of boiled water, close the lid and let it stand for about two hours. Strain well and use for rinsing the mouth, immediately before each meal. From the same mixtures drink medicinal drink tea. Sjogren's syndrome is a long and very hard disease, which in a large number of patients can can take up to several decades to heal. For mild primary forms of the disease symptoms are based only on the salivary and lacrimal glands and the disease is bearable, if prescribed therapy is applied. Secondary disease is manifested in other organs (internal) and must be treated with a systematic approach. With smaller number of patients this illness is unfavourable, mainly because of the association with other serious systemic diseases such as rheumatoid arthritis, lupus and a lot of rarely occurring complications such as inflammation of the wall of blood vessels, or cancer of the lymph nodes (occurs only in people who have long-standing problems with the salivary glands, but in very few cases). With appropriate hygiene measures, sufficient water intake during the day and care about dryness of the mouth and eyes, forecasts for Sjogren's syndrome are in most cases good: regular check-ups with your doctor are necessary.